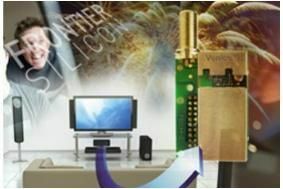 CES 2011: New Frontier Silicon module should see DAB available in a wider range of products | What Hi-Fi? The first such module from the company designed for slave mode operation in a wide range of products, Venice 9 should see DAB being added to products from mini-systems and home cinema in a box packages to iPod docks. It's fully compliant with the WorldDMB Profile 1 standard, meaning it can be used in all countries using the Eureka 147 digital radio standard. That includes the UK, Australia, France, Germany (where a national DAB+ service is due to roll out this Autumn), Switzerland and the Scandinavia countries. The module has been designed for low power consumption and enhanced reception, making it especially suitable for smaller devices, and supports FM RDS as well as digital radio. It's available with a built-in DAC, or can have an I2S output for devices with their own digital-to-analogue conversion.